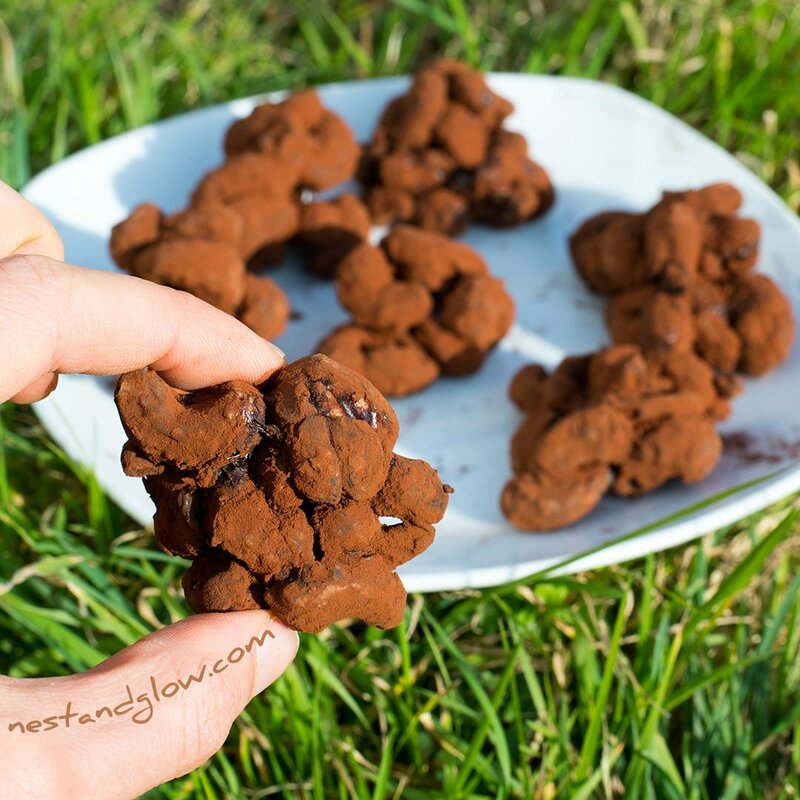 Easy to make cacao dusted cashew candy made from just three ingredients – cacao, coconut sugar and cashew nuts. Full of protein, heart-healthy fats, vitamins and minerals. No need to use a thermometer in this simple recipe and the candies can be made in a few minutes. Suitable for vegan, paleo, gluten-free, oil-free and plant-based whole foods diets. You can use different nuts or seeds in place of the cashew nuts, please see the notes below. Place the coconut sugar in a pan and heat on a very low setting. Add a tablespoon of water while stirring constantly. 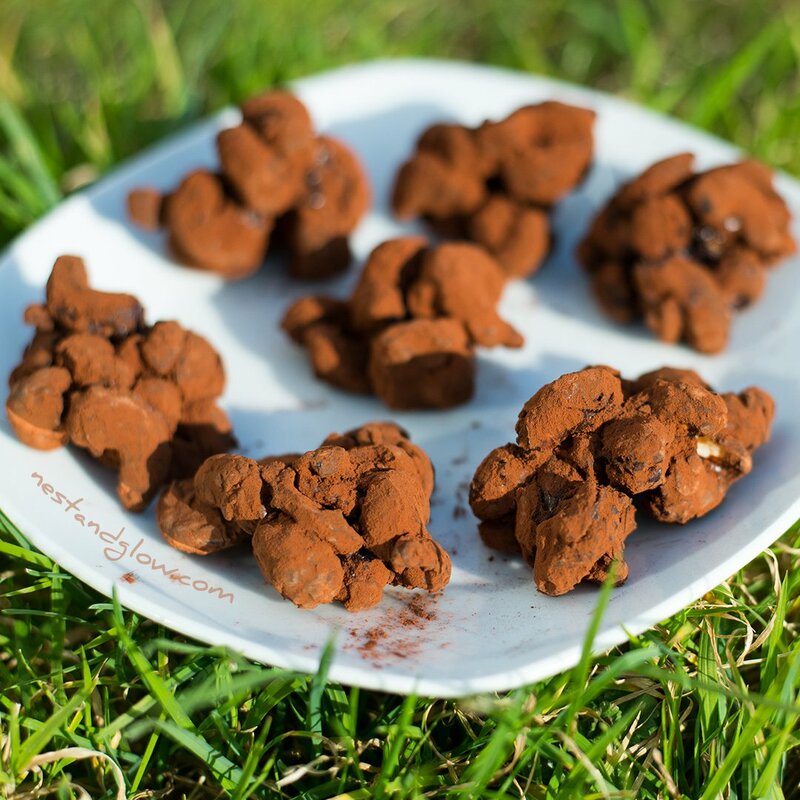 As the coconut sugar is all melted and starts to simmer stir in half of the cacao powder to form a thick paste. If it’s too thick that add a splash more of water. While still on the heat stir in the cashew nuts to coat them. Spoon on to greaseproof / parchment paper and leave a few minutes to set. 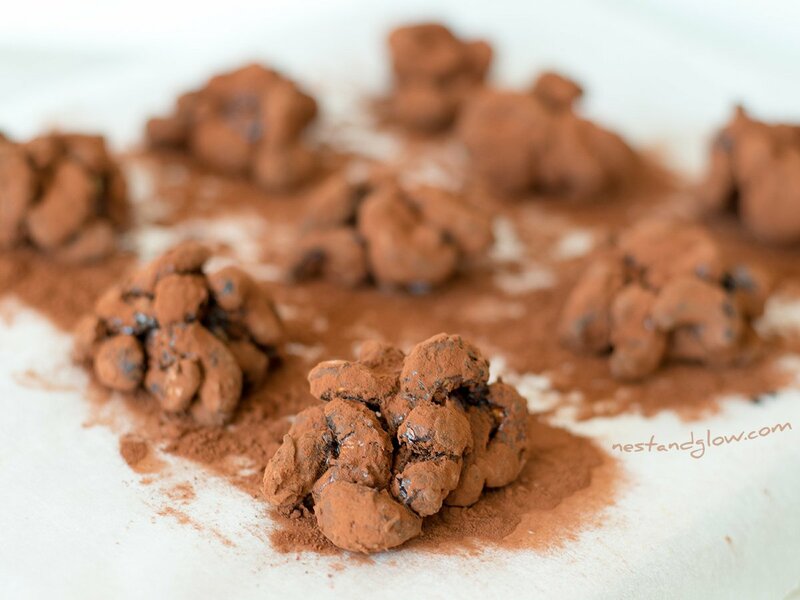 Dip the clusters in remaining cocoa powder in a bowl. Shake off the excess and place in the fridge for half an hour to set. 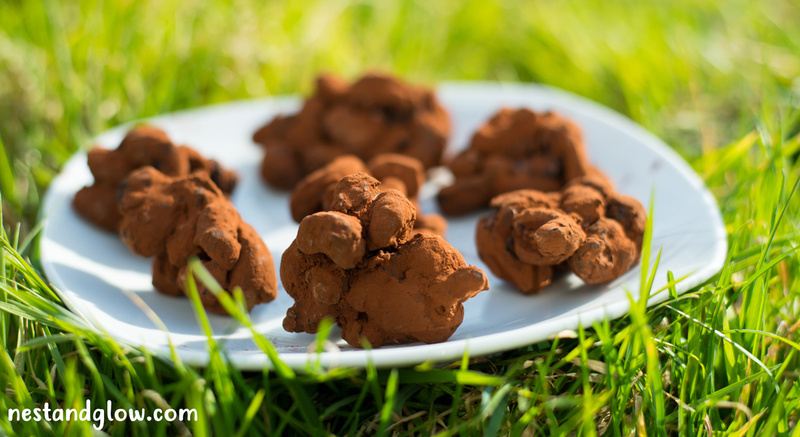 Keep in an airtight container and enjoy within a few days before they go soft. 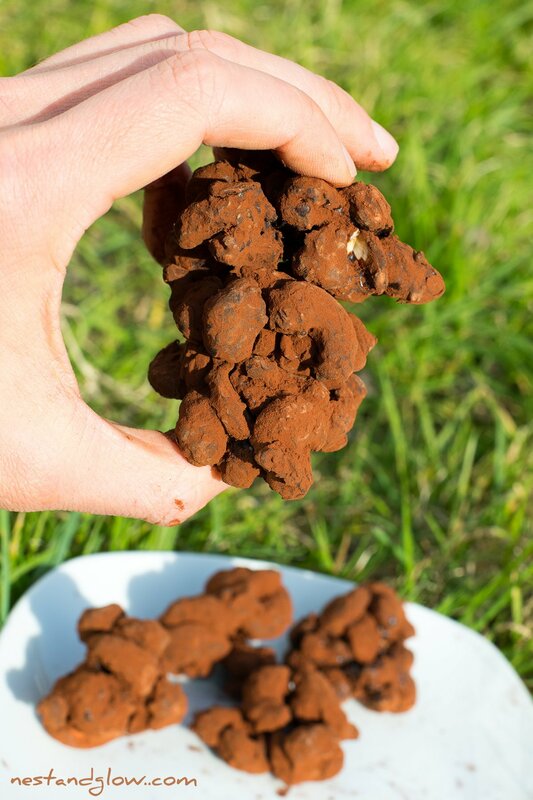 You could make these as individual cocoa dusted cashew nuts by spreading thinly after coating and separating when you dust. I was tempted to but thought it might be a bit fiddly and I prefer them in a portion size. I will update this recipe in the future when I do try this. 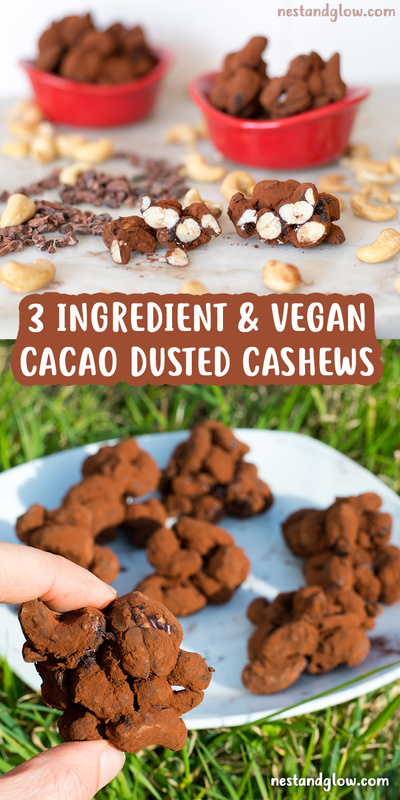 These vegan cashew nut clusters use the natural cashew creaminess to make them more like a milk chocolate sweet than a high cacao bitter dark chocolate sweet. Use the non roasted and salted cashew nuts for this recipe. I wasn’t sure whether not to dust these in cocoa they did look great without as had a glossy shine. But they were a bit sticky and a bit too sweet for me so I decided to dust them to make them more practical as I’m all about making recipes not just for aesthetics. If you think that a dusting of cocoa powder might be too bitter for your tastes then mix 50% cocoa powder with 50% powdered coconut sugar. To powder coconut sugar just blend it for a few seconds in a small jug blender or a coffee / spice grinder. 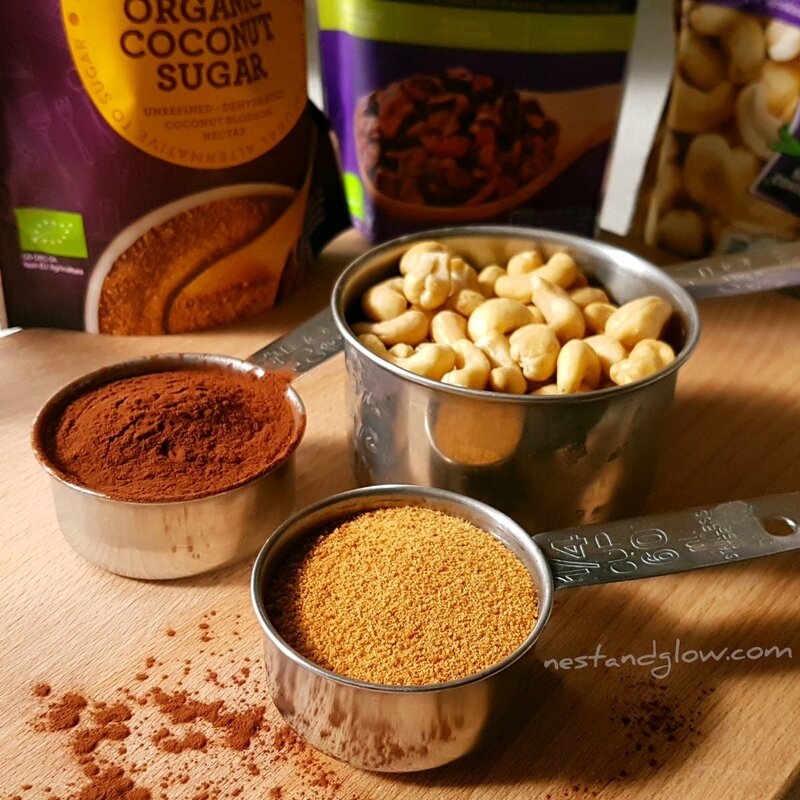 I was inspired to make this after having cocoa dusted cashew nuts by East Bali Cashews and going to a chocolate factory where they made a delicious chilled chocolate drink with just coconut sugar, water and cacao. This recipe does leave the pan and the spoon quite messy. However to avoid throwing away any of the goodness and to make cleaning up easy just simmer some plant-based milk for 2 minutes to melt all and make a hot chocolate. You can make your own plant-milk from sunflower seeds or just by blending coconut and water. To make this nut-free you can use sunflower seeds instead. Or to make it cheaper you can use peanuts. This works with just about any nuts or seeds that you like. 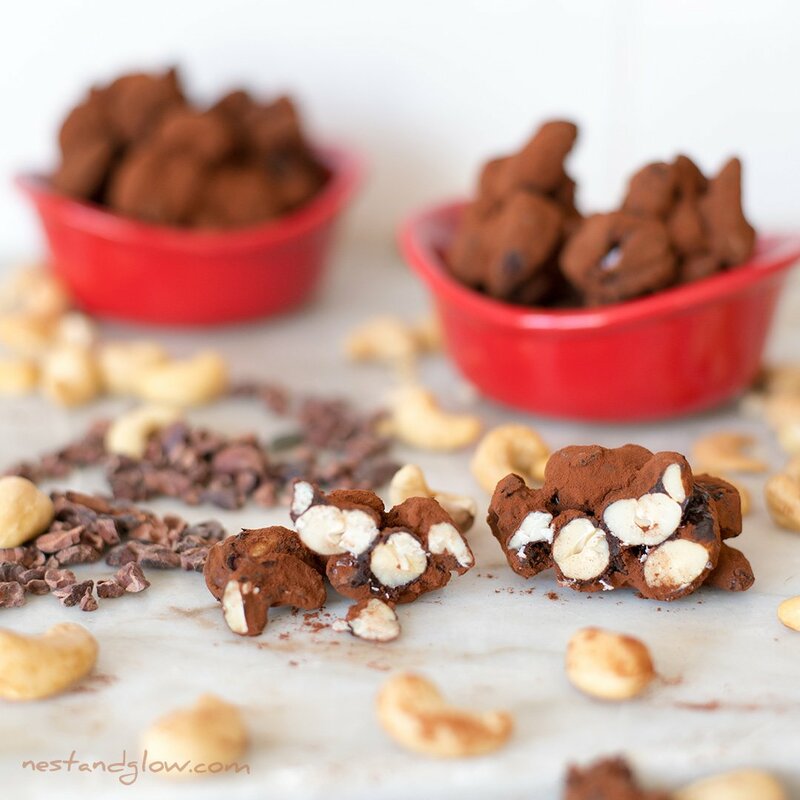 I do like it with cashew nuts as they have a great texture that goes so well with chocolate. 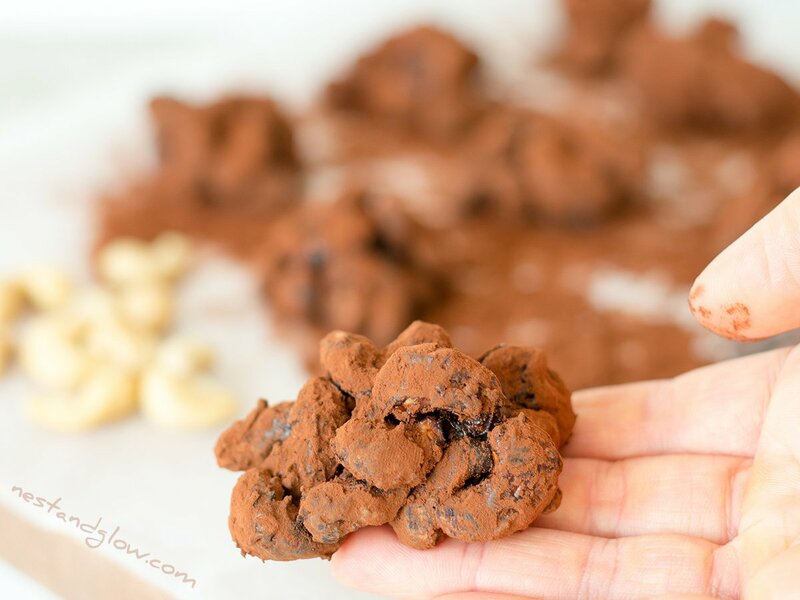 If you are looking for a lower fat similar recipe check out my 2-Ingredient chickpea protein candy.